Well I'm offsite this week in Colorado for the 232nd American Astronomical Society (AAS) summer meeting in Denver. 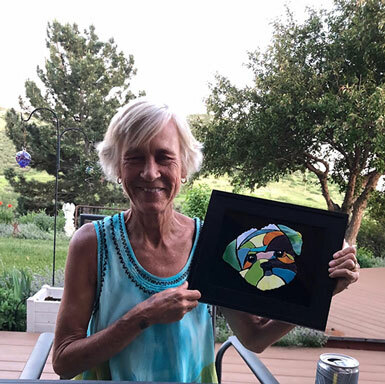 So I will make a few summary comments about what was going on at the AAS meeting, but first there is some old business from the ISDC meeting in Los Angeles and my chance to get together again with Searching for Gravity Waves, Dr. Gary, at his home about an hour outside Denver. 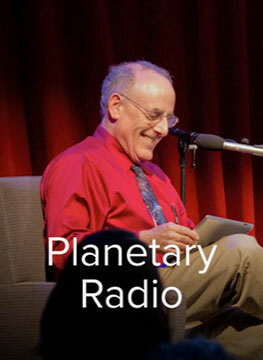 In the May 28th post, discussing the events at the ISDC 2018 in Los Angeles, I forgot to mention the Planetary Radio Podcast with Mat Kaplan. Just by chance we sat at the same banquet table with Mat and others, and I always find him such an interesting table mate, but I forgot to add the podcast to this website list of good places to check out. Mat always interviews interesting guests and the podcasts are always very good. So, check them out if you are interested in these spacey type things! Ok, so when I mentioned that I was going to attend the 232nd AAS meeting in Denver, Searching for Gravity Waves, Dr. Gary, said I should come up and an visit with him a couple of days before the meeting. Well, that sounded really great and I flew to Denver and drove about an hour his country "bed and breakfast". 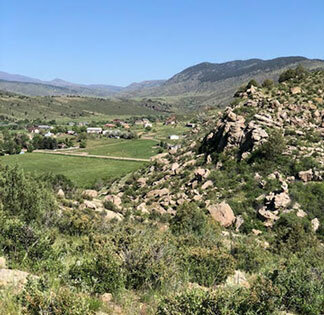 Wow, I had forgotten how beautiful it is in Colorado and I really enjoyed just experiencing the beautiful natural environment, like this view, just a few minutes from his home. Now I have gotten together with Gary at various other APS physics meetings at various locations, but this was the first time we got together at his home and with his wife, Real Country Girl and Artist Grave. It was really nice to finally meet Grace and they made my stay there very pleasant and enjoyable. Grace is a fantastic award winning artist with one of her pieces below. 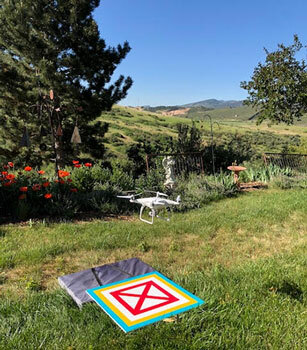 Before Gary and I got down to talking some real physics, we had to experience a little more of the great Colorado outdoors, so Gary took us on a tour of neighborhood with his drone. Wow, now I am starting to get hook on drones and I might have to see if I can me one of the big boy toys too! Ok, enough about toys, let's get back to physics. Dr. Gary and I discussed his citizen scientist project where he is involved with a real physics research project involving gravity waves and associated electromagnetic counterpart. This EM counterpart is not like the event looked for during a merger of two black holes or two neutron stars but has to do with comparing the light curve from an eclipsing binary pair of white dwarfs and the normal, ongoing continuous emission of gravitational waves that are produced. There are many instances of binary pairs of white dwarfs that orbit each other with say 15 minute period, which means they are travelling a good fraction of the speed of light. They are continuously emitting gravitational waves, not like the chirp frequency set for merging objects, but it will still be several million years before they collide and coalesce into just one compact object. Using general relativity you can correlate the gravitational wave frequency and observed amplitude with the Keplerian orbital elements. So when the gravitational wave detectors, such as LISA, come online with sufficient sensitivity we will be able to detect the rhythmic continuous emission of gravitational waves. Now, if the binary pair is also an eclipsing pair, then astronomers here can measuring the visible light curve and when the gravitational wave signal becomes measurable, the two waveforms can be compared. When the orbits of the binary pair are ideal circles, the gravitational waves will just be sinewaves, but when the orbit of the pair is more realistically elliptical, then the gravity waves are much more complicated, This makes sense because the gravity waves are caused essentially by the acceleration of the orbit and circular orbits have constant acceleration while elliptical obits have velocities and acceleration that varies along the whole orbit. It is working out all of these intricacies that Dr. Gary is doing. Now, I have dreamed about doing something like this as a citizen scientist, but, whoa, here Gary is actually part of a research team doing real science. Comparing the phase between the light curve data and the gravitational wave data will help to confirm the extent to which the gravitational waves travel at the speed of light. The two should be the same speed and is currently constrained to agree to within a second or so over a couple of million years of travel time. Anyway, Good job, Gary! Thanks for everything else also, Gary and Grace! Ok, the fun at Gary's has come to an end and it is time t get back to Denver for the AAS meeting. I took advantage of the big discount in conference fees for amateur astronomers, so I got to attend the whole week of meetings for only $50. Well, since the AAS does such a great job of encouraging amateurs to attend, I donated part of my conference savings back to their fund to pay for real graduate students' travel expenses to come to the conference. If they make it for me as a "senior student" to attend, then I wanted to help the "real graduate students" attend also. In addition, as a donor, you get invited to the donor reception. See below. Hey, that event worked as dinner! 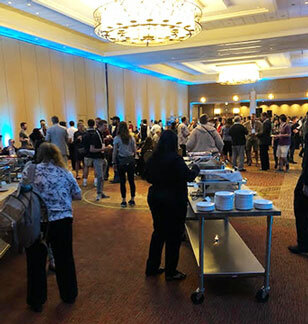 The AAS meetings are typically divided up into a series of plenary sessions and speakers, who address topics of interest to a general astronomy audience and into more technical sub-sessions, where more technical topics for the specialist are presented. I found the plenary sessions the easiest to understand and can summarize a couple of the sessions that caught my interest. I took many pages of notes, primarily of topics that were a bit too complicated to understand at the time, but which will form the basis of my homework later on, but I did want to mention just a few of the topics. First up, the Kavli Foundation Lecture, was given by Professor Debra Fischer, Yale U, on Exoplanets. She talked about the four most important methods of detecting exoplanets, (1) radial doppler velocity, (2) photometric transit, (3) microlensing, and (4) just barely, direct imaging. She also talked about the many opportunities for citizen scientists to participate in looking through the cataloged data for exoplanets. Next up, Professor Enrico Ramirea-Ruiz, UCSC, talked about heavy element synthesis in the universe. He described the nuclear processes, like the r-process, which includes the rapid addition of neutrons to nucleus formation and the s-process, which is the slow addition of neutrons, and how these two competing processes and the environment in which they are allowed to operate determines the type of nucleus that can be formed. As we have previously heard by LIGO detection of merging neutron stars, it is the r-process that seems to win out in that case and it is this process in which most of the gold and some other of the heavy elements is produced. And, Professor Alison Coil, UCSD, talked about the relationship between galaxies and large scale structure. The relationship between these two areas of study is continuing to make progress especially given how modern simulations are showing how one area affects the other and how feedback between the two helps constrain the growth of galaxies. There were also about 25 vendors and other astronomy associations on the exhibit floor and one that I stopped by was the Chandra X-Ray Center. They had a virtual reality setup where you put on the VR hood and then take a journey through the Cassiopeia A supernova remnant. I found it quite interesting to see all the detail that is known thanks to the pioneering effort of Chandra X-ray telescope. This was one of my first times using VR and I had to be careful not to spin around to fast because when I did that is was easy to get dizzy. 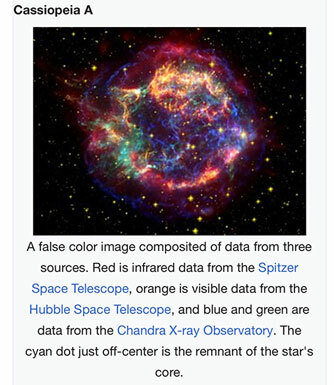 Just in case you don't recall how amazing Cassiopeia A looks, take a look at this Wikipedia image below which combines Spitzer, HST and Chandra data to make this false color image. It was so neat to take a virtual tour through all of the complexity of this remnant with various clouds of gas and jets. 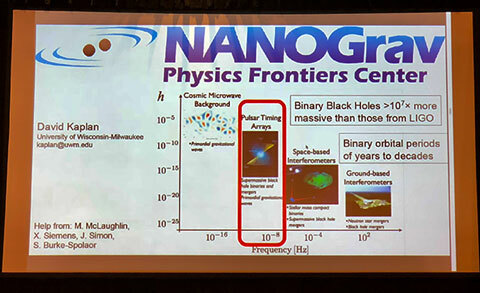 One of the other plenary speaker sessions that I attended was a townhall presentation on Multi-Messenger Astronomy, by which is meant to include three messengers: Photons, Particles and Waves. The panel discussion included all of these messengers, except for one speaker on neutrinos who had to drop out at the last minute. With respect to waves, the following slide presented by Dr. David Kaplan shows the range of applications for gravitational waves. The frequency range associated with astronomical objects and events goes from the very high frequency, of several hundred or thousand Hz, associated with merging black holes ad neutron stars, to the very low frequencies of 10 to the minus 15 Hz, associated with the inflationary birth of the universe. 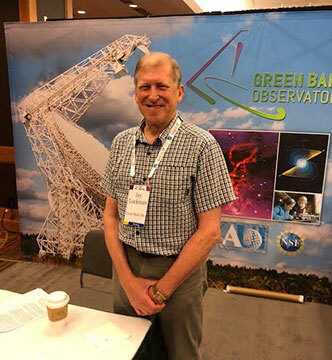 Finally, I did see at least one person who I recognized and that was Dr. Felix J Lockman of Green Bank Observatory, who graciously posed at the NRAO exhibit booth. I recognized him because he is the principle lecturer of the Great Courses lecture series on Radio Astronomy that those of us in the OCA Astrophysics SIG are studying. Thanks for all that Dr. Lockman!